Welcome to the website of the Roman Catholic Diocese of Hoima, Uganda. Hoima Catholic Diocese, is head-quartered in the city of Hoima in the Mid-western region of Uganda covering the Kingdom of Bunyoro Kitara, home to a variety of people, cultures and ethnicities. 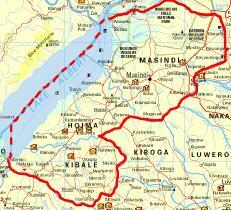 The diocese is part of the Ecclesiastical province of Mbarara, Uganda. You will find on this website information about the history, development and role of the Catholic church in this part of Uganda. The site exposes the Diocese, its Bishops, past and present (the Ordinary, and the Bishop Emeritus), the main functions in the diocese, diocesan statistics, religious communities of men and women with their respective addresses, other institutions including the minor seminary, catechetical centre, health centres, parishes, catholic schools, centres with resident priests, diocesan and religious priests with their dates of ordination. These pages highlight many ways in which we serve God through our service to his people. As you visit our web site, we hope you will understand better the scope of our mission – to live and proclaim the Gospel message of Jesus Christ. Perhaps you will want to visit one of our parishes. Perhaps you are looking for a Catholic school or religious education program. Perhaps you will be inspired to take part in some of our social, pastoral or educational ministries, or to learn more about the teachings of the Catholic Church. We ask you to pray for us as we continue to work with God. Embedded in this website is an invitation to join us, at least in spirit, in the ongoing mission of spreading the love of God made visible in Jesus Christ to today’s men, women and children. If this website can help to bring out the work we do, connect us with friends all over the world and act as another instrument in the evangelisation of the people of the world, then it will have served its purpose. As you browse the pages, remember to pray for our work and consider to participate in your own way in this mission to bring God’s love to all His people. Laudetur Jesus Christus nunc et in aeternum! Amen. Praised be Jesus Christ now and forever! Amen.